Three lawyers representing Al-Jazeera English journalists on trial in Egypt abruptly quit the case Thursday, accusing the Doha-based network of using the arrest of their staff to tarnish the country's image. 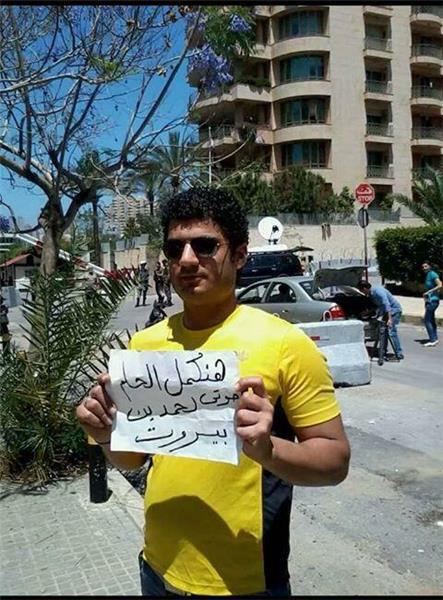 An Egyptian residing in Beirut holds a sign that reads "we will continue the dreams. My vote for Hamdeen. Beirut"
Egyptians living outside the country began voting in the presidential election, which will be held on May 26-27 in Egypt. The United Arab Emirates has no plans at present to step up its financial aid, the Gulf Arab state's finance minister said on Thursday. "We are talking about support (for Egypt)." Asked whether there were plans for more financial aid, he said: "No plans for now." The United Arab Emirates, Saudi Arabia and Kuwait promised more than $12bn in loans and donations to support the Egyptian economy after Morsi's removal in July last year. Earlier this month the head of Egypt's national oil company said Gulf oil producers had given Egypt a free fuel lifeline worth a total $6bn to help fend off unrest on its streets in the summer when consumption soars. Egypt's Minister of Interior Mohamed Ibrahim said the ministry formed a committee to revise presidential pardons granted to Islamist "extremists" by former president Mohamed Morsi during his one year in office. Soon after he was sworn into office, Morsi released tens of members of hard-line Islamist groups Al-Gama'a Al-Islamiya and Islamic Jihad, both of which had orchestrated acts of violence against the state in the 1990s. Previously, however, hundreds of other Islamists were released under the rule of the Supreme Council of Armed Forces (SCAF), during the period separating the ouster of Hosni Mubarak in 2011 and Morsi's ascent to power in 2012. The Court of Urgent Matters issued a verdict Tuesday upholding a previous one sanctioning the return of university guards to university campuses throughout Cairo. The main court originally issued a verdict on Feb. 24 to return university guards to campus but Cairo University Deans Council had rejected their return during a meeting on March 5 while discussing preparations for the second school semester. بعد الثورة بعام ونصف ذهبت للانتخاب وعينى على المستقبل..على الحلم. الآن وبعد عامين مريرين سأذهب وعينى على إنقاذ الحاضر مؤجلا الأحلام. Prominent actor Nabil al-Halafawi tweeted today saying "A year and a half after the revolution, I went to vote with my eyes on the future, on the dream. Now, and after two bitter years, I shall go with my eyes on saving the present, putting the dreams on halt." State run newspaper Ahram said activist Ahmed Douma, who is locked up in prison for allegedly breaching an anti-protest law, was moved to a hospital to have an x-ray and tests conducted after suffering from severe stomach infections. 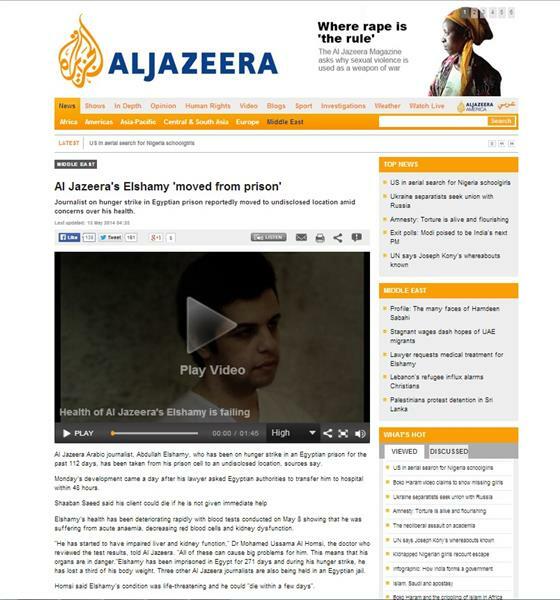 Detained Al Jazeera journalist Abdullah Elshamy has been moved to an undisclosed location amid concerns that his months-long hunger strike has had drastic impact on his health. For more about the health condition of Elshamy, click here. Abdel Fattah el-Sisi made a rare appeal Monday to the country's youth who were behind calls for regime change since 2011. He has been taken to task, even by supporters, for failing to reach out to the large youth vote. In an interview with Sky News Arabia on Monday, he gave a nod to revolutionary youth groups, but also underlined his message that Egypt now needs stability, which he has repeatedly said means an end to protests. "They must be sure they are hugely appreciated not only by me. But I can't get it to them frankly," he said when asked about the youth. He called their role in bringing about change "unforgettable." So far, el-Sissi has largely relied on interviews and closed-door meetings with supporters in his campaign, given the tensions swirling around him. He has not had a single street appearance since the official campaigning began in May 3. He has said two assassination plots against him have already been uncovered. insisting that democratic principles and human rights were guaranteed under the new constitution. Sisi, who is expected to easily win the May 26-27 election, said last week that democratic aspirations expressed in mass protests since 2011 were affecting national security and slowing a much-needed economic recovery. Egypt said Monday it has dismantled three "terrorist cells" targeting security forces, including one run by jihadists and another operated by student supporters of ousted Islamist president Mohamed Morsi. "Police efforts resulted in the arrests of terrorist elements of these cells which targeted security forces," interim interior minister Mohamed Ibrahim said at a news conference. He said one group was operated by Ajnad Misr (Soldiers of Egypt), a jihadist movement which has claimed several attacks targeting policemen in Cairo. Unidentified men torched the Sharqiya headquarters of Abdel Fattah al-Sisi's campaign on Monday before escaping, a security source said, according to Aswat Masriya. The fire destroyed the main gate of the office which had on it a large portrait of Sisi, early investigations have revealed. Egyptians will vote for a president on May 26 and 27 in elections between former army chief Sisi and leftist politician Hamdeen Sabahi. An Egyptian court on Sunday sentenced 36 students of the prestigious Al-Azhar university to four years in prison each over violent protests backing ousted president Mohamed Morsi, judicial sources said. The 36 students were found guilty of holding a violent protest in December, rioting, blocking roads in front of the university and showing aggression against the security forces, the sources said. Egypt's state-run newspaper said the coordinator of presidential candidate Abdel-Fattah El-Sisi's campaign in Alexandria, Mostafa Kadry, has resigned on Saturday in protest at what he described as the dominance of remnants of the Mubarak regime in the campaign. He said the decision came due to the presence of 17 figures allegedly remnants of the toppled regime of Hosni Mubarak in the campaign backing the ex-minister of defence. "When I complained about their presence to members of the Cairo-based official central campaign in a meeting Friday, I was surprised to find that they saw no harm in their presence in the campaign," said Kadry, who added that his decision came out of faith that "the presence of Mubarak's loyalists in the official campaign contradicts with what El-Sisi announced as a refusal of the return of the former regime." 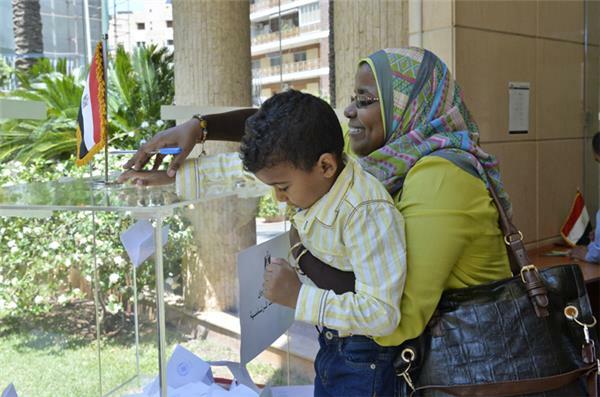 The General Secretary of Egypt's Supreme Committee for the Presidential Elections said 67,000 citizens abroad have registered to take part in the upcoming race end of this month. In an interview with a local private channel reported on by Shorouk newspaper, Councillor Abdel Aziz Salman denied unofficial reports that Egyptian diaspora are about 7 million people in number. He said only 450,000 Egyptians are officially registered as being out of their home country. Members of Hosni Mubarak's former ruling party, the National Democratic Party, were banned by court from running in the upcoming presidential and parliament elections. Gulf oil producers have given Egypt a free fuel lifeling totalling $6 billion in value to help fend off unrest on its streets in the summer when consumption soars, the head of its national oil company said. 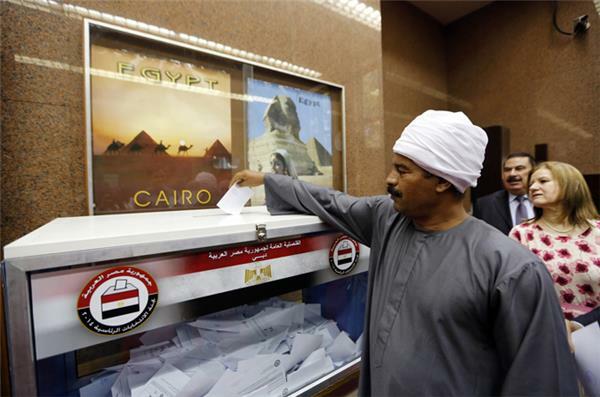 The date of parliamentary polls in Egypt will be decided by the political rights law committee, a spokesperson said on Sunday according to state-run Ahram newspaper. "The parliamentary election will be called for by the committee and not the president. 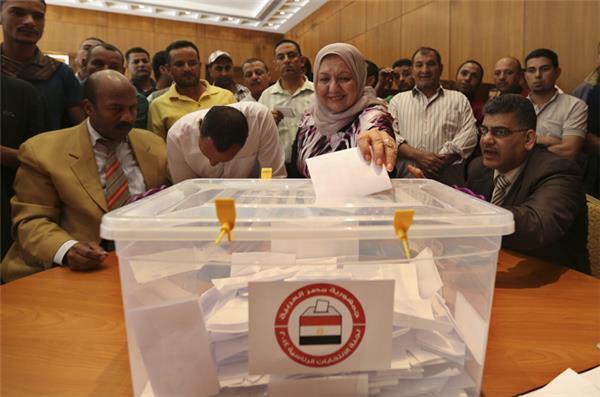 This will ensure full judicial supervision of the election from beginning to end," Judge Mahmoud Fawzy said. "The High Constitutional Court made it clear that the president should not interfere in the election process." The parliamentary election should be held within six months of the passing of the new constitution. Fawzy also announced that the committee had chosen the mixed electoral system, combining individual candidates and party lists. State-run Ahram newspaper quoted Egypt's Coptic Orthodox Pope Tawadros II on Sunday as saying that the church would not support either candidate in the country's upcoming presidential race. "I ask each citizen, Christian or Muslim, to read each candidate's electoral program and choose who he wants to be president," Tawadros said during an interview with Hamel El-Resala, a newspaper issued by the Catholic Church in Egypt. According to the publication, an interview with the pope was published in a Kuwaiti newspaper last March in which he urged El-Sisi to run for Egypt's presidency. A few days later, Tawdros vehemently denied having given any interviews in "the past two weeks." |@abdallahelshamy 's wish was to return home before his 26th birthday, which will be on May 5th. Detention extended for 45 days today. After throwing out media and arguing with defendants, judge cancels today's hearing for mass trial including @abdallahelshamy . 45 more days. A former cellmate of late South African President Nelson Mandela has called on the Egyptian government to release four Al Jazeera journalists imprisoned since last year. Ahmed Kathrada, who was Mandela's cellmate at Robben Island, told Al Jazeera that press freedoms were important to protect democracy from government violations. John Greyson was recording the carnage of a day-long massacre of Egyptian demonstrators last year when he was detained by Egyptian police and sent to the infamous Tora Prison, where the country's worst criminals reside. There he would remain crammed in a cell for 50 days, alongside 36 others. The Canadian filmmaker described his experience to Al Jazeera. Egypt's only two presidential candidates Field Marshal Abdel Fattah El-Sisi and Hamdeen Sabahi launched Twitter hashtags in an early start to their electoral campaigns on Saturday. Sisi’s launched a hashtag called #LongLiveEgypt (in Arabic), while Sabbahi’s hashtag is #WeWillContinuetheDream. “I promise to work hard, and I demand that everybody take responsibility with me. Building this country is the responsibility of us all,” Sisi said on his Twitter account. The High Presidential Elections Committee will also decide on Saturday on Sabbahi’s violation in holding an urgent meeting, in which he announced his platform before the scheduled time.
.@AbdullahElshamt has arrived in court, along with around a dozen other defendants.
. @abdallahelshamy said he has lost 35kg since starting hunger strike in January. Received no medical care. Journalists now thrown out of courtroom. Hunger striking journo @AbdullahElshamy has arrived in court - has lost a huge amount of weight. Says prison conditions not fit for animals. #AJtrial judge orders trial adjourned until May 15th. Bail denied. #AJtrial – @PeterGreste : "You can't have a free society without a free press. 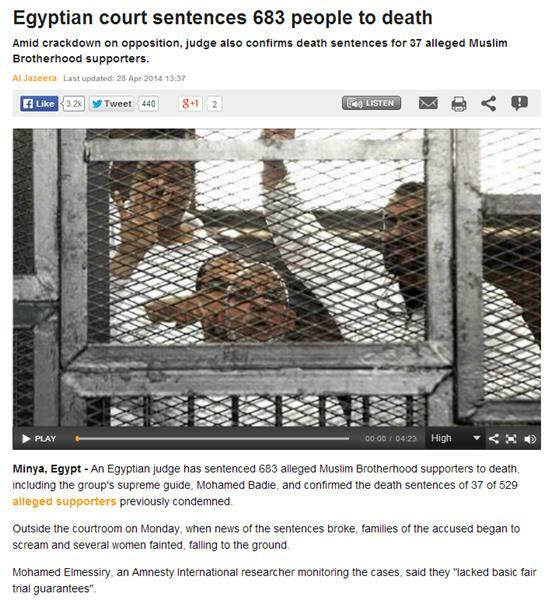 In Egypt today you know that you can't provide balance as..."
#Ajtrial – @PeterGreste cont: "... long as you can end up in prison like us." 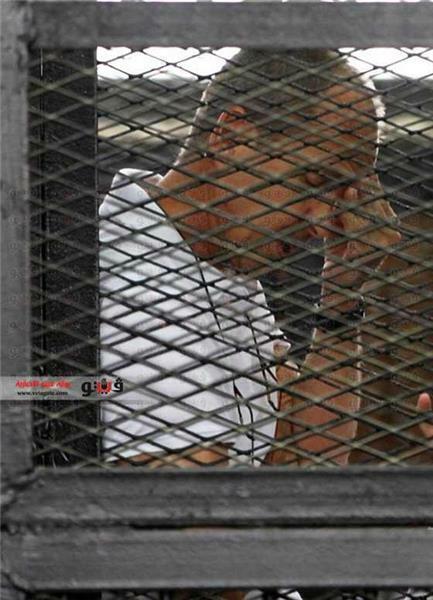 #AJtrial – @PeterGreste : "We've spent nearly 130 days in jail. It feels like a massive injustice regardless of the outcome." #AJtrial : @PeterGreste tells reporters: "It's a massive injustice regardless of the outcome." Al Jazeera's Peter Greste has sent a letter from Egypt's Tora prison to thank those who are campaigning against his imprisonment. The Press Freedom Award comes at a time when all I think about is how to stress the plight of many local journalists detained in Egypt who have not receive a fraction of the attention I’m getting. 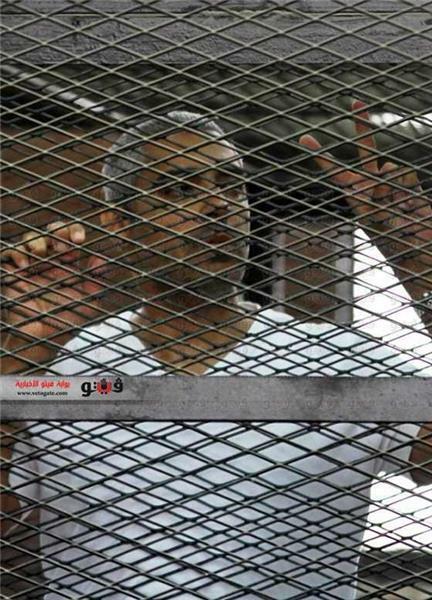 - Al Jazeera's jailed journalist Mohamed Fahmy on receiving the Press Freedom Award. One of Al Jazeera's jailed journalists, Mohamed Fahmy, has received a Press Freedom Award for his contribution to the industry, in advance of World Press Freedom Day on May 3. Heliopolis district, security sources said. The Friday attack came hours after a suicide bomber killed himself and a soldier at a security checkpoint in Egypt's South Sinai, and a second bomb attack in the same area wounded at least three. Security officials say two suicide bombers have struck in Egypt's restive Sinai Peninsula, killing one soldier and wounding nine people. The officials say the attacks happened early on Friday in the region of el-Tor. In the first attack, the bomber targeted an army checkpoint. One soldier died and five were wounded in the explosion. The second bomber stepped out on a road and blew himself up in front of a bus. Four passengers were wounded from that explosion. The officials say body parts of the bombers littered the sites of the attacks. The officials spoke on condition of anonymity because they were not authorised to talk to the media. French Foreign Minister Laurent Fabius has criticised Egypt for imposing death sentences on nearly 700 suspects, most of whom are Muslim Brotherhood members. Abdullah al-Arian, Assistant professor of History at the School of Foreign Service at Georgetown University, speaks to Al Jazeera about the mass death sentences handed down by an Egyptian court to Muslim Brotherhood members. Egypt has banned a pro-democracy movement that helped ignite the uprising that toppled Hosni Mubarak in 2011, tightening a crackdown on dissent ahead of the country's presidential election. A Cairo court was ruling on a private lawsuit brought by a lawyer who alleged the April 6 movement had conspired against Egypt to serve "foreign parties" and staged protests that had "insulted national security" and damaged the economy. In an official document released after the ruling, the court did not comment on the specific accusations made against April 6 by the lawyer, Ashraf Saeed. But it said the issues raised represented a "real danger". "It is necessary to immunise the country from this danger," it said. The lawyer had also accused April 6 of seeking protection from the United States, using media to cause "anarchy" and attacking security institutions, a reference to the storming of the headquarters of Egypt's domestic spying agency in 2011. April 6 was one of the youth protest movements that harnessed social media to bring people into the streets for the historic Jan. 25, 2011 protests that led to Mubarak's downfall at the height of the "Arab Spring" uprisings. It also took part in protests that led to the army overthrow of president Mohamed Morsi in July last year but has since mobilised opposition to the military-backed government, rallying against a law that tightly restricts street activism. The "Cairo Court for Urgent Matters" that issued Monday's ruling was the same body that last year banned the Muslim Brotherhood, the movement that propelled Morsi to the presidency in a 2012 election.